Height 5 feet 8 inches. Weight 154 lbs. Chest measurement 34-37 inches. Complexion fresh. Eyes blue. Hair fair. Sight, hearing and colour vision all normal. Limbs and chest well formed. Full and perfect movement of all joints. Heart and lungs normal. Teeth good. Free from hernia, varicocele, varicose veins, haemorrhoids, inveterate or contagious skin disease. Vaccinated. Good bodily and mental health. No slight defects. 29 August 1915 - suffered a shrapnel wound to the side. Gunshot wounds in the abdomen. 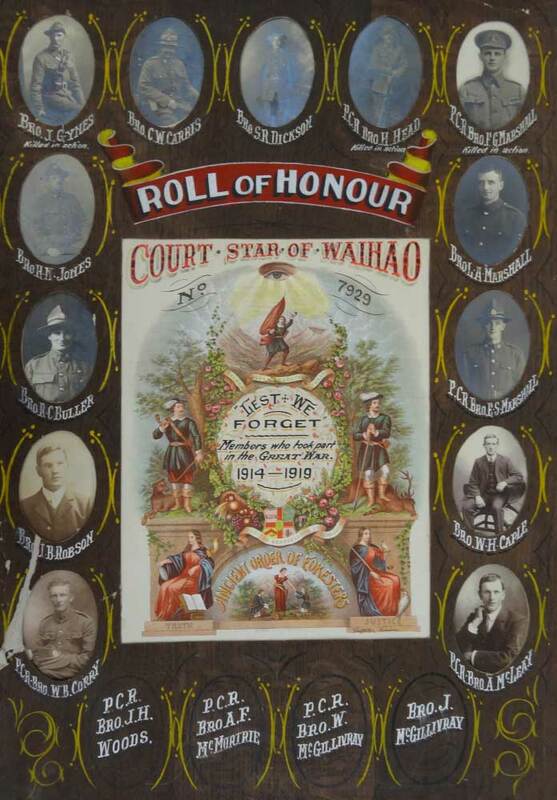 Timaru Memorial Wall; Waimate War Memorial; Geraldine War Memorial; Hook Memorial Hall tablet; Court Star of Waihao No. 7929 Roll of Honour. James Gynes was born on 8 July 1876 at Timaru, the eldest son of Albert and Harriet Louisa (nėe Hillier) Gynes, of Hook, Waimate, Canterbury, and formerly of Rangitata. This was the only Gynes family living in New Zealand. Albert Joynes [sic] and Harriet Hillier had married on 27 August 1871 at West Dean, Gloucestershire, England, and immigrated to New Zealand by the Otaki in 1875-1976, with two children. In the 1880s and 1890s Albert Gynes worked as a water race ranger in the Rangitata and Orari district for the Geraldine County Council. By 1886 he was serving on the Rangitata Station School committee, was re-elected in 1887, and throughout the 1890s. He was a very active member in supporting the school, notably in the successful concert held in aid of school funds in September 1891. James and his siblings were educated at the Rangitata Station School. There in 1887 he was awarded 2nd place in Standard II, his sister Mary Jane coming in at 3rd equal in the same class. The Hon. W. Rolleston, in presenting the prizes, “impressed upon the children the great importance of education, and urged them to prosecute their studies diligently, so that they might be better fitted for their various callings through life.” One son, William Francis, died tragically at the age of 1 year 9 months in 1888 when he fell into a well. By 1906 Albert had moved to Hook. His wife Harriet had died on 21 August 1898, after a short illness, and Albert himself died in 1927. 1914 was a notable year for the Gynes Boys. On the outbreak of war their father, Albert, subscribed £1 to the Waimate Patriotic Fund. 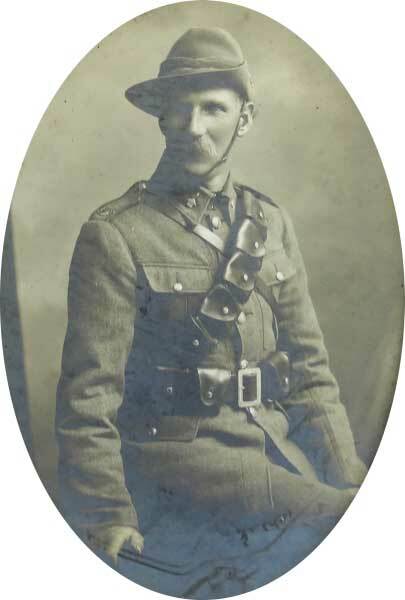 James was one of three sons of Albert who left for the Front in 1914. He was with the South Canterbury Mounted Regiment, along with his brother Thomas, while Jack served with the Canterbury Infantry Battalion. His brother David John Gynes (Jack) was killed in action in 1917 in Belgium. And another brother, Thomas Ernest Gynes, was wounded at the Dardanelles, returned home invalided and, after recovering, went to the Front for a second time. Yet another brother, Edward Albert Gynes, a dairy farmer of Hook, appealed his call-up in 1917, stating that three of his brothers had gone to the Front; two had been killed and the other was home again; that he would like to go too, but he had to think of the farm. James was among the early enlistments in Timaru, having volunteered and passed the medical inspection at the Drill Shed in Waimate, ready to leave “at any moment” in early October 1914 for the concentration camp at Trentham. He was in a party of young men who left Waimate by the express in mid October 1914 for life under canvas at the Trentham reinforcements camp. At 38years of age, he was likely one of the oldest of the group. Of fresh complexion fresh, with blue eyes and fair hair, he was 5 feet 8 inches tall, weighed 154 lbs, had chest measurement of 34-37 inches, and was in good health overall. Single, Anglican, and nominating his father as next-of-kin, James was living at Makikihi and was engaged in farming, having previously been a labourer at Morven and a storekeeper's carter at Springfield. Trooper James Gynes left New Zealand on 14 December 1914, for Suez, Egypt, disembarked at Alexandria on 2 February 1915. Six months later he was dead. One can only guess at his movements and experiences during the intervening months in the Gallipoli campaign. He was first reported as wounded. He had in fact died on 31 August 1915 at sea on board the “Devanha”, of a shrapnel wound to his side and gunshot wounds to the abdomen received at the Dardanelles two or three days earlier. He was taken ashore at Mudros for burial. His father received notification of his death on 17 September. In April 1915, when Jack Gynes was wounded, James and Thomas Ernest were serving with the South Canterbury Mounted Regiment. In September 1915, just after James had died on the hospital after being shot in the abdomen, his brothers David John and Thomas arrived per troopship in England, wounded. “The Gyneses are spoken well of by their neighbours at Makikihi, being quiet and cool but strong of physique and of great courage. The afflicted father bears his burden with Spartan fortitude.” (Waimate Daily Advertiser, 20 September 1915). A. Gynes and family placed an acknowledgement notice of sympathy conveyed in their sad bereavement in the Timaru Herald on 4 October 1915. Trooper James Gynes is remembered on the Lone Pine Memorial. Lone Pine Cemetery, Anzac, Turkey, and also on the Timaru Memorial Wall, the Waimate War Memorial and the Geraldine War Memorial, as well as the Hook Memorial Hall tablet and the Court Star of Waihao Lodge Roll of Honour WWI (photograph). From January 1917 the names of all three Gynes brothers were published in the regular “Waimate’s Roll of Honour, Great War of 1914” column in the Waimate Daily Advertiser. Yet another brother, Edward Albert Gynes, a dairy farmer of Hook, appealed his call-up in 1917, stating that three of his brothers had gone to the Front; two had been killed and the other was home again; that he would like to go too, but he had to think of the farm. Thus he remembered his brother James, farmer and keen angler. James Gynes’ medals - 1914-15 Star, British War Medal and Victory Medal - were to be sent to his niece, Miss Irene Winder, of Papanui, Christchurch, the scroll and plaque to his father. He was also awarded the Gallipoli Medallion. By his will, the effects and credits of his estate were to be held for the use and benefit of this same niece (at the time still a minor). In 1962, Mrs Ruth Smith of Edendale wrote to Army Headquarters enquiring about unclaimed funds in her father's estate, funds which she believed were hers by right as she was the only living descendant of James Gynes 7/724 killed in the first world war. She received no joy in the response - all pay records had been destroyed and claims for payment were no longer recognised. It was extremely unlikely that any credit due to her father's Estate had not been paid out. On 29 August 1922 the Hook Soldiers' Memorial Hall - described as one of the finest halls in any country district in Canterbury - was dedicated in the presence of a large number of residents and visitors, and a memorial tablet above the door was unveiled. Impressive and inspiring addresses were delivered. A guard of honour of returned men, in uniform, was present. Was brother Thomas in this guard of honour? And the "Last Post" was sounded before afternoon tea was handed round by the ladies of the district. The names inscribed on the tablet include James Gynes and David J. Gynes. J. Gynes features in a photograph (held by the South Canterbury Museum) of Waimate volunteers for the Main Body, 1914, assembled at the Drill Shed in preparation for their medical examinations; and in a portrait on the Court Star of Waihao No. 7929 Roll of Honour WWI.